We’d love your help. 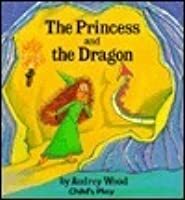 Let us know what’s wrong with this preview of The Princess and the Dragon by Audrey Wood. To ask other readers questions about The Princess and the Dragon, please sign up. This is one of my favorite children's books ever. I loved this when I was little. Everyone I have introduced it to loves it too. Decent story and illustrations but nothing special. Okay kids story about a princess who is very rude, and a dragon who is very poised and proper. 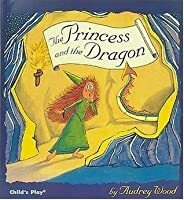 When the dragon refuses to kidnap the princess, they instead decide to switch places, with the dragon playing the part of the princess, and the princess living wild in a cave. Obviously no-one even notices the switch, they are just glad that their princess is suddenly so well behaved. The story is told in bold writing, but then the things that the characters say are written in bubbles within the pictures Okay kids story about a princess who is very rude, and a dragon who is very poised and proper. 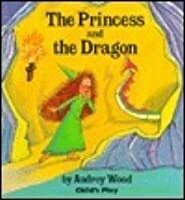 When the dragon refuses to kidnap the princess, they instead decide to switch places, with the dragon playing the part of the princess, and the princess living wild in a cave. The story is told in bold writing, but then the things that the characters say are written in bubbles within the pictures like a comic book. Once upon a time there was a princess who acts like an animal. She was impolite to everyone. whereas a dragon which lives in a cave on high mountain was very polite and sweet. The princess wanted to change her position with the dragon. After that, the dragon received lots of love from all people, but the princess got to change like a dragon. Recently there are lots of children who not follow their parent's word. Chilren can learn the courtesy and polite manner from this book. A book about a princess who is very rude and mean, and a dragon who is very poised and sweet. They switch places and makes the world happier. You can talk about how stereotypes are not correct. Also touch on children who misbehave. I thought this book was kind of funny, however I didn't like how the rude princess was happy in the end after they switched places. I would rather have her learn her lesson by being nicer. This book is about a princess who wants to be a dragon, and a dragon who wants to be a princess. Although the book is good at highlighting that it's ok to be something different to what we are expected to be, I feel like the author could have covered that aspect a bit more in the story. All in all the book is enjoyable and a good read. 3.75 Stars Oh what a fun and silly book! The Princesses likes to be a messy life and the dragon wants to have pomp and circumstances...they switch places and oh the fun they have! Fun pictures fun stories! Fun!! Audrey Wood studied art and drama at the Arkansas Art Center in Little Rock, Arkansas. She has owned an operated a book and import store, taught chldren's drama and art, and traveled throughout Mexico and Guatemala studying Indian folk art. She now lives in Hawaii with her talented family (husband Don and son Bruce, who have both collaborated with Audrey by illustrating some of her books).